Horowhenua District Council is undertaking Stage 1 of a district-wide review of speed limits on rural roads. Submissions close at 5PM on 15 March 2019. Extracts below, but read the full information at the link. This review affects most of the rural roads reached by turning off SH1 onto Waikawa Beach Road. We’ve collated the individual suggestions from the proposal document available at the Council’s website (and linked below in case their link disappears). Their document doesn’t mention our Whakahoro Road (opposite 363 Waikawa Beach Road), but we’ve queried that. Update: Brent replied: As the section of Whakahoro Road off Waikawa Beach Road isn’t a Council maintained road this is not included in the statement of proposal, this road has always been treated as a paper road hence why it is not included. The overarching purpose of this review is to ensure that safe and appropriate speed limits are set on Council’s roads, thereby enhancing the safety of the district’s road network. By reducing the speeds it reduces the severity of crashes so that there are less fatalities and serious injuries. The review also aims to establish consistent speed zones, minimising frequent changes to speed limits, so the public knows what to expect and to avoid confusion. Following an initial online survey of community views, Council is now inviting written submissions on the proposal to reduce speed limits on rural roads. The submission is for all rural roads throughout the district where the speed limit is currently 70 km/h or higher. You may comment as an individual, or on behalf of groups and organisations. How to make a submission – it’s easy! Anyone can have their say on proposed changes to speed limits on rural roads as part of the district-wide speed limit review. You can make a submission by either filling out an online form or by filling out the downloadable print form (which can also be picked up from and delivered to our service centres). 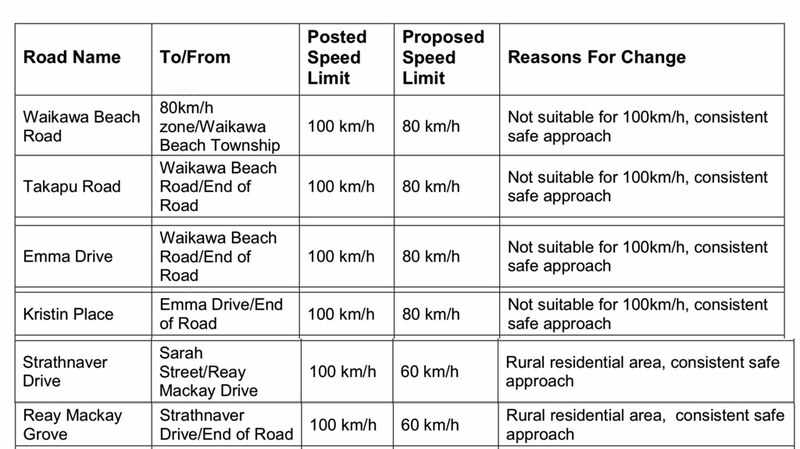 Source: Review of Speed Limits on Rural Roads – Horowhenua District Council. The specific proposals drop the speed limit from 100 kph on all our public rural roads to 80 Kph for Waikawa Beach Road, Takapu Road, Emma Drive and Kristin Place, but to 60 Kph for Strathnaver Drive and Reay Mackay Grove. It’s hard to believe that any of those smaller roads were 100 Kph to start with. Proposed speed limits on ‘our’ roads. See the proposal: 2019 Statement of Proposal Horowhenua District Rural Speed Limit Review Appendix (155 KB PDF). 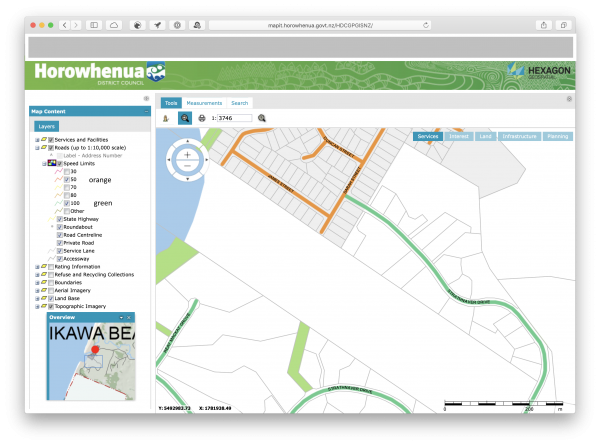 As well as sending a submission to Horowhenua District Council please leave a comment below so the Waikawa Beach Ratepayers Association also knows what people in this area think of the proposals. It’d be good to see a constructive discussion on the proposals. Does not matter what the speed limits are on waikawa beach road, it will always be used as a race track by many. Monitoring by police or speed cameras necessary. Since when is strathnaver drive a 100 k zone? Yes by default its 50 km same as Sarah Street, seems like Council are actually thinking about increasing the speed!! these two roads can only be reached by driving through Waikawa Beach village which has a 50 Kph speed limit. Fortunately there are no speed signs on either of these roads (and we don’t want any). Many or perhaps most believe people the speed limit on these 2 roads is still 50 Kph as in the village. * many people already believe that 50 Kph is the speed limit on these roads (and some have suggested 60 Kph would be an *increase* . * these roads are at the end of the line — there is no other settlement to be reached via these roads. Reducing the speed limit to 50 Kph would not be disadvantaging any other settlement. * the Strathnaver area is becoming increasingly built-up. In the last couple of years roughly a dozen houses or baches have been constructed or begun in this area (or the site is currently being prepared). * as in the village, the roads are popular with cyclists, horse riders, pedestrians, dog walkers, quad bikes, towed horse floats and even tractors towing boats. Reay Mackay Grove offers two beach access points where people congregate and load or unload families, equipment, dogs. I believe the speed on Waikawa Beach Road should be reduced to 80 Kph from SH1 to the village. This road has become increasingly busy over the last few years. It feels narrow and there is no hard shoulder. Large trucks and trade vehicles often use this road, especially with the recent spurt in building in the Strathnaver and Emma Drive areas. Cyclists are becoming more common. It would make sense for any roads leading off Waikawa Beach Road to have limits the same as, or lower than, Waikawa Beach Road. That affects Takapu Road, Emma Drive and Kristin Place. Thankfully most people drive at 50kph along Strathnaver. 100kph is obviously an oversight from NZTA and surely with this now being brought to their attention it will change.